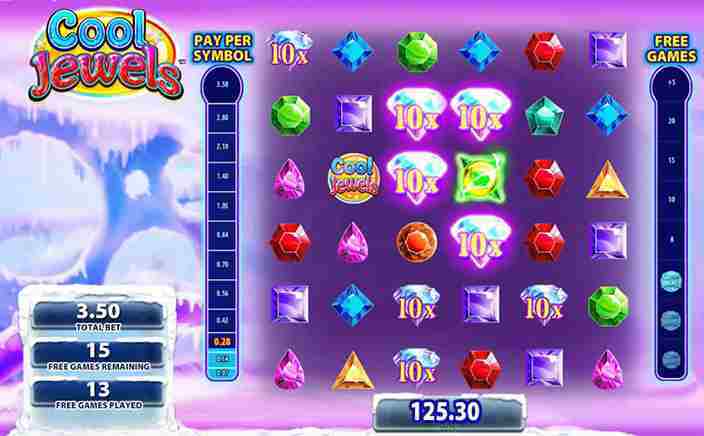 If you love gems and jewels then Cool Jewels slots is the game you want to consider playing as it offers 6 reels and 6 rows with various winning combinations. Set in the backdrop of a snowy winter with an animated image where you can see snow falling silently to the tune of magical sounds. On the game screen, you can also see the statistics of the number of times your bet amount that you won in that spin. The right-hand side of the screen shows the number of spins you won too. The betting amount starts with £0.50 and goes up to a max of £200 per spin that offers up to 400 times bet multiplier. The developer is Williams Interactive, an innovative online casino gaming company with many popular games for online users. It is a new company that has earned immense popularity in a very short period that has managed to win the hearts of millions with their games. There are eight random gems that make the base symbols of the Cool Jewels slots game and there are no values assigned to these symbols. It works like those match 3 jewel games but it is a match 4 here, when 4 or more symbols of same kind matches, they disappear and new symbols appear. The matching symbols must be connected either horizontally or vertically or a combination of both. There are also special symbols that appear among the matches that activate special features that shoot all the gems in a specific pattern to win your more money. Wild Symbols: There are four types of wilds in this Cool Jewels slots game; shocking wild, unstable wild, shattering wild and persisting wild. They appear only on reels 2, 3, 4 & 5 and each type of wild is represented by unique gem symbol. Every wild has different abilities to clear the gems on its way in a specific pattern and make way for new gems that can give you an opportunity for winning further. Wild Enhancements: Apart from each wild clearing some gems, when two wilds appear next to each other during a spin, a special reaction occurs that clears a huge number of gems on the slot. There are 9 combinations possible with these wilds that can create three different watermarks; green watermarked symbols tuned into wilds, pink marked explodes and blue marked symbols offer 10 times win on your bet. 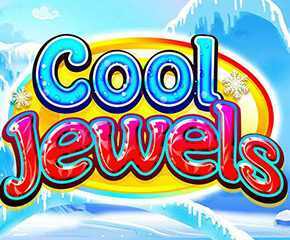 Cool Jewels slots is not your usual slot game but offer a completely unique gaming experience with huge winning possibilities. The reactions caused by wilds offer graphically amazing visuals that make the whole game fun and entertaining.